Unst has three local shops, each one located in Baltasound. The Final Checkout Shop has a healthy selection of goods (fresh, frozen and shelved) along with home tools, crafts and other unique supplies. They supply fuel and garage services and are located at Hagdale in Baltasound. Cars and bikes can also be hired. A cash machine exists within the premises which can used for a nominal fee. They can be contacted on 01957 711666. It is normally open from 8am til 6pm (Monday – Friday), 8am til 5pm (Saturday) and 11am til 5pm on a Sunday. Skibhoul Stores is located in Baltasound and stocks a variety of goods you may require. Their bakery is popular throughout Shetland for their high quality bread, bannocks, water biscuits and oatcakes. Fuel can also be purchased here. Cash can be obtained here through use of the ‘cashback’ facility and it is also a National Lottery retailer. They can be contacted on 01957 711304. It is normally open from 9am til 5.30pm (Monday to Saturday) and til 6pm on a Thursday. Skibhoul is closed on Sundays. Henderson’s Stores, locally known as Ethel’s sells a wide variety of produce and home tools. The store also offers a cashback facility. They can be contacted on 01957 711411. It is normally open from 10am til 6pm (Monday to Saturday). Henderson’s is closed on Sundays. Fuel can be purched from P&T Coaches (located next door to The Final Checkout Shop and Cafe) and from Skibhoul Stores – both located in Baltasound. 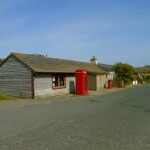 Baltasound Post Office is situated next to Skibhoul Stores. Here you can get your letters/postcards franked from Britain’s most northerly Post Office. They also stock a variety of stationery and offer cash obtaining facilities (most banks). They can be contacted on 01957 711655. Garage Services and Motor Repair can be sought at P&T Coaches. Car hire is available through P&T Coaches. Bike hire is available from P&T Coaches and Unst Cycle Hire. The Unst Leisure Centre provides many sporting facilities and also offers showers at a small charge. It boasts a 12.5m heated indoor swimming pool with lagoon and it can prove an ideal alternative to roaming the countryside. In addition to the pool, the Unst Leisure Centre has facilities for aerobics/aquarobics, badminton, basketball, birthday parties, carpet bowls, fitness suite, hockey, community room, netball, pool, rolller skating, short tennis, solarium, squash, table tennis, tennis and volleyball. There is also an outdoor full-size football pitch, which is home to Unst Football Club. Being part of the Shetland Recreational Trust, the Unst Leisure Centre is one leisure centre in a network of 7 leisure centres all over Shetland. It is open all year round. We would highly recommend downloading the Move To Unst: The Essential Guide as this will contain extra information on amenities, facilities, local clubs and a variety of other elements to Unst.